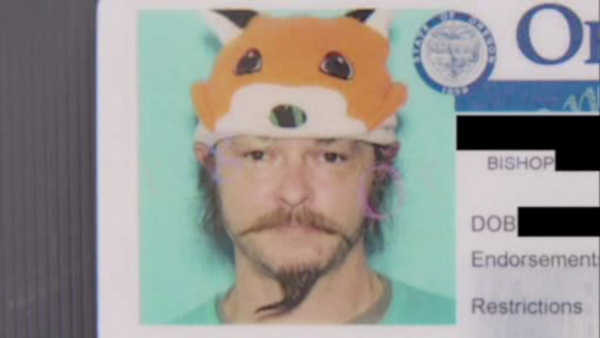 PORTLAND, Ore. (WABC) -- A man in Oregon says the DMV denied his license renewal because they thought he was wearing a silly hat in his photo. However the man says that was a violation of his religious freedom - and a judge agreed. The man, who goes by the name 'Bishop' is a practitioner of a Native American religion, in which each person has a wild animal totem. His is a fox - hence, the hat he wears wherever he goes. The DMV, however, says the hat interfered with its facial recognition software, leaving bishop without a license for nine months. "It shouldn't matter if it's a yarmulke, or a hijab or a 'silly fox hat' as the man at the DMV wants to call it," Bishop says. He is now urging others to stick up for their rights, no matter what it takes.